China’s business & start-up incubators are adopting different models than those popularized from Silicon Valley and other mature, Western ecosystems. The drivers developing a different incubator model are rooted in a different local context, but the successful application of these models can have global implications. I’ve been tracking the term ‘incubator’ on Twitter since last year and am amazed not only by the number of incubators that have sprung up all over the world, but also how many diverse and loose definitions of ‘incubator’ there are. By ‘incubator’ I do not just mean co-creation space, or consolidated back-office support, or start-up competitions, or a crowd-sourced website of projects, or classes on pitching and writing business plans. By ‘Incubator’ I DO mean in addition to the above, tactically helping to build businesses through to sustainability by bringing in the needed people/partners, asking the right questions & molding the business model, coming out with a working product/service & organization, and utilizing ready-made launching platforms which include financing, marketing and/or retail/distribution channels. It is important to first understand the cultural and social significance of incubators in western society to help us gain a comparative perspective on how China incubators will impact a new generation. The reason why the start-up incubator is enjoying success and widespread popularity in our time and not before has to do with one unique occurrence: The rise of the highly educated, freelance individual. While two other factors have also been vital for the popularization of incubators – 1) macro economic demand for innovation competition, and 2) an abundance of investment capital looking for alternative asset classes and the development of mezzanine financing options – only the rise of the highly educated, freelance individual is unique to this generation and unique to the rise of the incubator. The expansion of a highly educated mass population happened in western society and North America with education reforms and a greater access to higher education in the Post-War era. The popular expansion of the North American freelance culture (as documented by Douglas Holt in ‘Cultural Strategy’) began in the 90’s as we experienced the early 90’s recession and then accelerated as corporations and industry underwent an intense period of outsourcing, thus shifting us away from the concept of lifetime employment. And so since the 90’s we’ve witnessed the emergence of a highly educated, freelance generation. These individuals, being more creative, independent, and autonomous, have been building a new proposition of economic pay-off that rewards ingenuity and seeks not a steady pay-check, but periodic bulk payments that allow for more pivots in a person’s freelance-style career. Additionally, as an economy built on high-educated, freelance culture demands greater creativity, integrated thinking capacity, and greater specialization, these individuals seek an actionable, and reliable form of collaboration that will see their unique capabilities and ideas properly utilized. 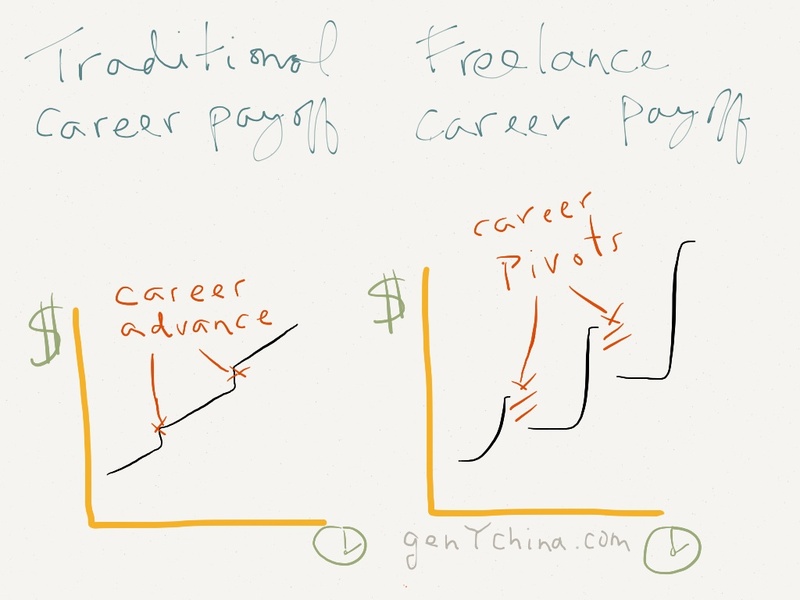 It’s therefore understandable why it is this generation, a highly educated and freelance group, which would construct and consider start-up incubators a viable and important vehicle for long-term freelance achievement, and career success. In fact, as chronicled by GigaOm, the first popular wave of incubators emerged over 10 years ago, during the Dot-Com boom, when high-educated freelance culture hit its first period of maturity. The current wave of incubators like the iconic YC, TechStars, and 500 Startups are a product of A) a much more networked, collaborative culture, learned and reinforced by social media’s dominance in our society, B) further maturation and refinement in the venture capital/private equity apparatus, plus C) the justifiable fixation on timelines and incubation processes specifically catered to technology and digital venture types. The Silicon Valley incubator model is built to graduate start-ups within 3 months of incubation. Fast ideas, fast iteration, fast testing, fast scaling. High independence, high autonomy. This is the incubator’s cultural legacy we’ve inherited from the success of Silicon Valley and American-style venturing from a generation of highly educated, freelance individuals. There is a growing perception that the Incubator can become a new model for graduate school. I too observe that this generation is beginning to perceive incubators as having the same cultural significance as graduate schools. Indeed, these are important implications for how a new generation of young Americans and global citizens will classify ‘education’, fit for their future world. 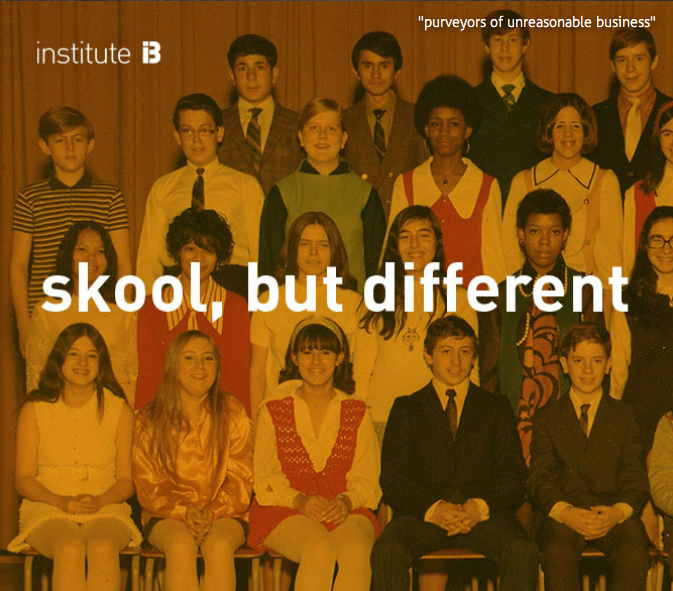 instituteB - a Canadian Incubator reframing as a new kind of 'skool'. But with this understanding of the cultural role of the Incubator for a highly educated, freelance society, the Incubator finds a different role in China and is therefore developing into a different creature. Over the last year, a number of China incubators have either reformed, or newly emerged, as professional enterprises, away from the classic western incubator model that just serves as a prototyping platform for independent start-ups. China Incubator Enterprises are acting more like niche early-stage private equity acquisition groups – without the private equity. Incubator Enterprises characteristic #1: A longer timeline with greater vested interest. These China incubators are elongating the incubation period, bringing the start-up more permanently into the incubator, well beyond the traditional 3-month timeline. Often times the gestation period is dependent upon the start-up’s complexity and development needs. Many times incubators will not graduate a start-up until there is a fully sustainable business model, and there is more to show than just a prototype product. This is taking a page out of more established corporate innovation processes, like the one system made famous by 3M. Here, what is provided is not only space and supplies for a team to get their idea off the ground, but the host organization also takes a lead responsibility in filling the missing team and functional gaps such as finance, marketing, project management, and strategy. In this way the incubator graduates not only entrepreneurs with a product and some mentoring, but instead a founding team, fully equipped to grow from start-up to small business. Innovation Works, an incubator I’ve written about before, was one of the very first China Incubators and still one of the most famous. Created by Ex-Head of Google China, Li Kai Fu, they incubate tech start-ups, but bring these companies in-house and build out fully functioning teams around them. They usually graduate only after a product is tested and there are investors lined-up to take it to the next step. This whole process normally takes much longer than 3 months. Incubator Enterprises characteristic #2: Cut out start-up pitching, instead cultivate investor expectations. Whereas the mark of a great incubator in western countries is giving the start-up a chance to pitch to a packed room of potential investors, China Incubator Enterprises instead opt to act as agents, selecting the right investor introductions and brokering the right deal. This deal making has much to do with the fact that each incubator has pre-existing relationships with a set investment community or network, usually specializing in one specific area of interest. In some cases, an incubator’s inception is the direct result of a pre-existing fund’s desired investment objectives, looking to develop investment opportunities. With the Incubator Enterprise knowing the investor preferences and objectives so well, there is little need for pitching but instead collaborating with the investors on their investment expectations and involvement right from the outset. In this way, the start-up, and the investor(s) are developed from inception to be the perfect partners. Xindanwei has been the poster-child for Co-working spaces in China since its launch in 2009, with a very distinct and strong open community culture. Last year Xindanwei expanded to build Xinchejian (New Garage), a specialized program for the Open Hardware, hacker and maker communities. Xinchejian provides specific events, workshops, machining tools & technology, plus prototype product exhibitions; all crucially needed to grow this emerging community. What is more, this special unit has developed its own network of specialized partners and investors, people who have a specific interest in funding and prototyping co-hacked gadgets. These partners coming in at the very earliest stages and develop ideas together. Incubator Enterprises characteristic #3: Find industries to fill beyond tech. The emergent Incubator Enterprise, with the intention of incubating longer, more thoroughly, and molding investor expectations from the beginning, find greater capabilities to nurture new business models. This is proving powerfully applicable for capturing the new opportunities emerging from China’s diversifying economy needs. Each Incubator Enterprise, in capturing its industry specialization, is also customizing their incubator to fit the specific needs of that industry’s start-up needs and also that industry’s investor requirements. With this evolutionary approach, Incubator Enterprises from different industries will have different incubation timelines and boast different incubator component strengths. It is only in customizing the incubator format can the incubator fill the needs existent beyond tech. Transi.st is an incubator that seeks to develop tech that has direct impact on social good. Shifting from the ideology that a start-up’s primary path leads to IPO, Transi.st chooses its China incubation projects first for its scalability in social impact. Yuenfen-Flow has constructed itself as the nexus between tech, business, art, and sustainability. Boasting its offering of methodologies such as IDEO’s Human Centered Design, Yuenfen-Flow chooses its projects for their creativity and the merging of artistic and technical form and function. Jue.io is perhaps one of the most exciting examples of an Incubator Enterprise, specializing in manufacturing incubation. Jue,io seeks to attract creative youth culture products; from new iPhone case concepts to innovative RFID key chains for offline social networking. Jue.io was set up to cater to the needs, expertise and interests of its founding investor, who comes from the manufacturing industry. Boasting a vast network of OEM manufacturer relationships, Jue.io offers not only team, product development, and funding for the right manufactured product idea, but also the right manufacturing and distribution partners. Jue.io’s incubator capabilities are specialized for the needs of the industry it serves. It is easy to see that these incubator innovations come from the different industry forces present in China’s very different economy. As chronicled above, traditional western incubators are a product of a driving macro demand for innovation competition, a mature alternative asset-class investment community, and a highly educated, freelance generation. China does not strongly possess any of these forces. The incubator was started in China not as a reaction to competition need, but with the intention of leading social change. It found itself in an economy with a very immature investor community, and within a generation and culture that is not overtly highly educated nor freelance. And so in order for the incubator to survive, flourish and add value in a different industry context, the China incubator has had to evolve, with a longer timeline, a greater vested interest, a different approach to cultivating investors, and filling opportunities in many other industry fields. These non-traditional forces are not unique only to China. We are seeing the incubator evolve into Incubator Enterprises in other fields that require adaptation for distinct requirements. In Canada, an Incubator Enterprise exists named InstituteB, a specialty incubator focused on sustainability start-ups and cultivating particular skills for the sustainability field with special relationships with sustainability-focused investors. They also bring in start-ups for a long timeline, build thoroughly, and graduate only with the right investor already in place. And so as people have alluded to the Western incubator as a new form of graduate school for a highly educated, freelance generation, what is the meaning of the emergence of China’s Incubator Enterprises to this new generation of Chinese? I would offer a suggestion that China’s Incubators act more like the equivalent to an after-school program, or a special summer program, or an extra-curricular sports team. What I mean is that it is within these kinds of environments that many Western-raised children first developed specialized skills, and first learned how their unique skill integrated into a larger team. More importantly it is within these extra-curricular program that many talented youth first developed passions for personal hobbies and interests, and added very important components to their developing self identity. I feel the China Incubator’s cultural role is providing a similar, and vital service, albeit not extra-curricular, but full-time. Leading edge Chinese youth, with newly constructed identities and the beginnings of unique talent, are in need of space to refine and sharpen what raw ability they have. Incubators become the place this cohort of creative talent can deepen who they are and sharpen their skill. This being still one of the earliest generations of Chinese creative talent, these innovators have not enjoyed as comprehensive an upbringing as the young talent in other mature societies. Therefore Chinese incubators are calibrated to allow participants to specialize on one creative ability, while the incubator fills the other skill gaps. As a consequence, the incubation period grows longer; to not only allow the business to mature, but also the creative talent powering it. Incubators in China can develop in this way because China creative talent is still so rare and offers the great potential for highly unique value creation. As the competitive pressures in China continue to rise, the value proposition to incubate talent and new China business solutions is something no investor can ignore. It is within these incubators that a new generation of Chinese creative talent is realizing that there are other options to their future career and life path. For the first time China’s creative middle class sees a viable, and socially acceptable path to having one’s own ideas & inventions realized. The new Chinese incubator enterprises are in part instigating new culture, and may become the modus operandi for a new creative class of Chinese youth.